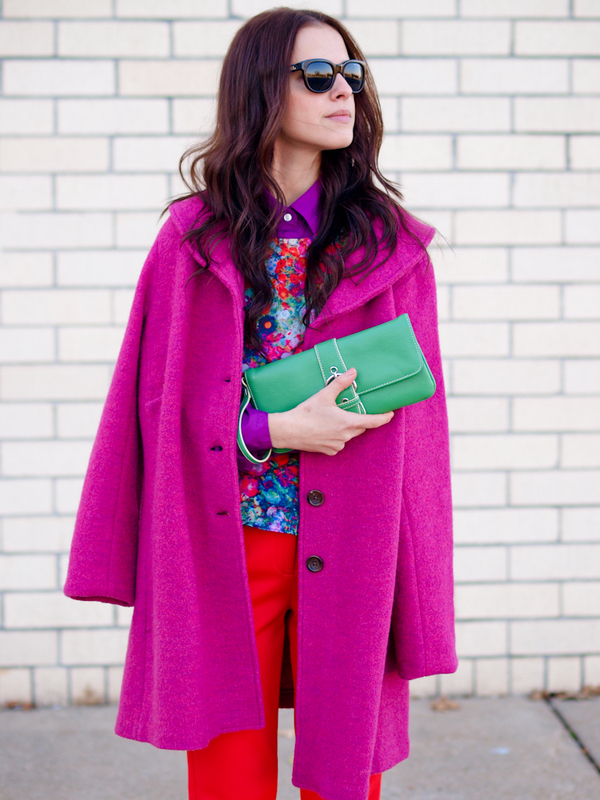 The last but not the least outfit in my Lulu's.com project is inspired by Fauvism art. I let this outfit the last one because is the most colorful and fun from this series of 4( you can see Baroque insipred HERE, Art Deco inspired HERE and Impressionism inspired HERE). Red neoprene pants, a floral top, mustard shoes and my Land's End fuchsia coat are a wild mix and make a perfect sense why "les fauves" translated means "the wild beasts". I hope you enjoyed this miniseries of "wearable art"as much I loved wearing them! so gorgeous! i love these colors. This was so much and I am sure a thrill for you with your love of art! The colors here are fantastic! Did you color your hair???? Looks darker..love! I am in LOVE with this outfit, the color combo is so fresh and exciting, and those neoprene pants…. I’m heading over to lulus right now! what a gorgeous coat! I love it! And the whole image as a whole as always very interesting and beautiful! I love this outfit, it’s so colourful and cute! gorgeous look dear. i love it!!!! Loving all the colors together! Love this bold combination. The tailored shirt under the peplum has me swooning. Wauw this outfit is wonderful! Love. Love. Love your heels! Cute look! Loving that blouse and your pumps! so beautiful colors ! it’s brighting up the winter ! love it ! Veronica, I’ve said it so many times before but I seriously can’t think of a blogger who has more of a way with colours than you do! So beautiful! wow, these colours are amazing! i love this look! come check out my new post with the look I wore at the Fashion Week, i’d love to hear your opinion! Gorgeous, gorgeous combination of colours! I especially like red paired with bright fuchsia pink. Such a powerful combination! last photo is fantastic! Love these bright colors together! You look so pretty. I love your colourful outfits, amazing!! Love this outfit!! I love all of your colorful pieces – you do such a good job pairing everything together! woohoo powerful and so elegant! This is the epitome of urban chic in the middle of winter! I love how you take risks with prints, textures, and color. Chic as always.